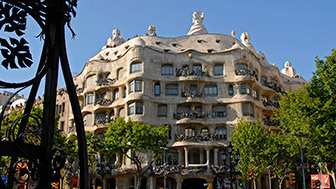 Casa Batlló, an iconic Gaudí building on Passeig de Gràcia, represents the artistic splendour of this unique architect. 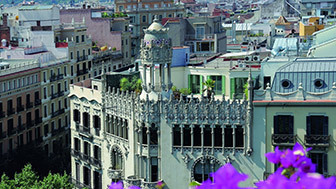 Declared a World Heritage site by UNESCO, its undulating roof, which reminds you of a dragon's back, is one of the icons of Barcelona Modernisme. Casa Batlló, pure Modernista fantasy, is the work of the architect Antoni Gaudí, a symbol of a period and a very specific social class: Barcelona's bourgeoisie at the start of the 20th century. 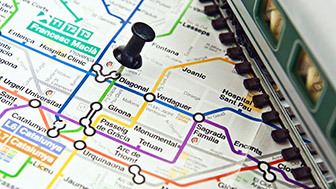 It was a time when, thanks to the implementation of the Cerdà Plan that had started at the end of the 19th century, many well-off families moved to Passeig de Gràcia and also established their businesses there. One businessman who did just that was Josep Batlló i Casanovas, who, in 1903, acquired the original building on the site and a year later, in 1904, hired Antoni Gaudí, already very famous, to remodel it. What the architect did was a turning point in modern architecture and left an artistic legacy for posterity. By applying his naturalistic ideas, with undulating and organic shapes, and creating a new facade totally clad in stone and glass, and inspired by coral, he gave the building a completely new and original appearance. At the same time, Gaudí's main aim was always functionality, so it is worth noting the attention he paid to the lighting and the ventilation. He introduced a large interior courtyard that the service rooms looked out onto, while the salons and bedrooms were on the side of the facade. Even today Casa Batlló is seen as an original and daring work, something that gives it incalculable value and led to it being declared a World Heritage site by UNESCO. La Pedrera is one of the masterpieces by the great architect Antoni Gaudí.